Captain’s, President’s, Lady Captain’s and the Major prize presentation evening, when lounge type jacket and ties and appropriate dress for Ladies must be worn. Outdoor clothing i.e. (or similar) leather jackets, golf waterproof jackets, headgear of any type, denim or other types of jeans and any other form of denim wear are not acceptable in the Main Lounge, Dining Room or the area of the Office. Denim wear is acceptable in the Games Room and on the Patio with access to the club using the locker room entrance. The wearing of t-shirts and shirts without collars and sleeves, tracksuits or shell suits, training, track or sports shoes are not allowed. Shirts worn by gentlemen must be tucked into trousers. On social occasions, when smart casual dress is permitted, the correct type of shirt worn by gentlemen need not be tucked into trousers. All shirts must have collars and sleeves and must be tucked into trousers or shorts. Ladies may wear tops with collars and no sleeves. Shirts bearing advertising motifs, slogans or illustrations are not allowed. Crew necks, t-shirts, football/rugby jerseys, denim or other types of jeans or any other denim wear are also not allowed. A golf manufacturer’s logo is acceptable. The wearing of trousers tucked into any type of sock, unless they are specifically designed for the purpose, (e.g. : Plus 2s/4s), is not acceptable. Tracksuits, shell suits or trousers with elastic bottoms are also not acceptable wear. Shorts, if worn, must be tailored and knee length. Accompanying these shorts, knee length socks are standard but sports socks (white, unless part of a matching outfit) and trainer socks are acceptable. Shorts as described above may be worn in the clubhouse until 7.00pm. 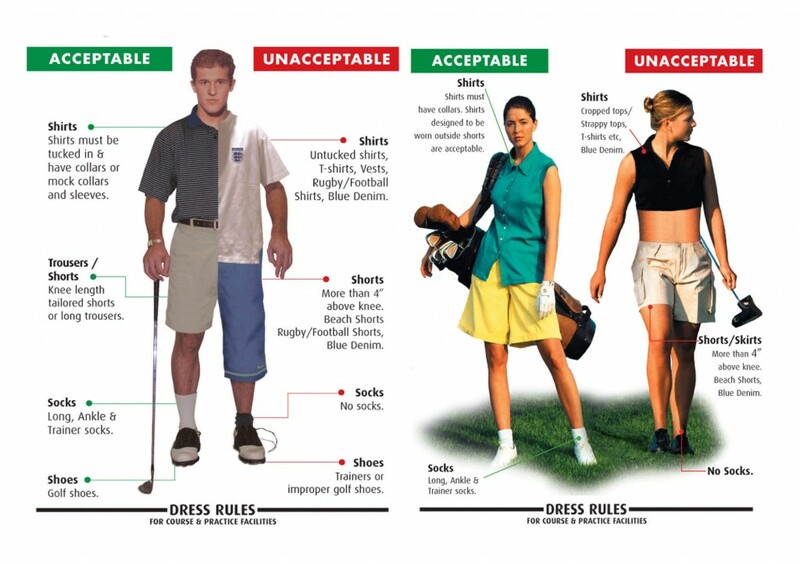 Golf shoes must be worn, other forms of footwear are not acceptable. Headgear is expected to be of a traditional type associated with the game of golf. If a peak cap is worn, the peak must point forward. In all matters relating to dress the Board of Directors interpretation of acceptable wear is final. The Professional and all Golf Club staff have been instructed to refuse any and all services to anyone contravening these rules.